Why does one pull at a scab? Why does the restless tongue probe the throbbing cavity? Why does the mind will a strained ligament to move beyond its tolerated range of motion? What demons prompt us to revisit particularly painful events in our life and dwell on them, drawing sadistic succour, until they become substantial to our present, influencing who we are and what we do? Flippantly do we say that we are happy with out current lot but time is made of many moments, and the scales, when weighed with brutal honesty, invariably tip in favor of a deep-seated melancholy interspersed with only the briefest of levity. Look in between the weft and warp of our time here and you see the one constant is grief, sole monarch, in all his saturnine moods, manifesting a volatile irritability that lashes out and recedes into listless apathy in equal measure. 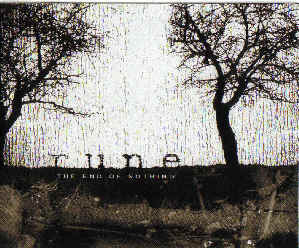 Rune‘s first and only outing excelled at maintaining a consummate balance between death metal with wildly non-linear structures, and a naked vulnerability reminiscent of the finest of early 90s doom. The End Of Nothing is a demonstration in how unbridled technicality can be successfully used as means to a higher end; despite its accomplished nature, this music affords a stripped down, cross sectional view of the interplay of emotions resident in the mind’s cellar. Rune utilize the death metal dissonance of early Immolation and Gorguts on Obscura but instead of losing themselves in unmitigated malevolence, Rune take apart each component and shape it as a phrase of lament to fit amid the greater bleeding of the dirge. Tempo changes are frequent but never gratuitous, each signaling a shift in texture and mood. Steadily seething white noise and subtle reverb act as droning accompaniments, well invoking a paranoia of closing walls. Rune write actual metal songs but The End Of Nothing, in many ways, also carries the spirit of pioneering industrial band Throbbing Gristle, hinting at a post industrial dystopia and the itching void that it may leave within the human psyche. Despairing, it imagines a future while looking wistfully into a past forever lost; ten years after its release, having stayed unacknowledged for the duration, this album remains a classic of truly personal, honest, dark death metal. This entry was posted in Death Metal, Retrospective and tagged Rune, The End Of Nothing. Bookmark the permalink.